Front line employees represent your brand on client touchpoints and need to look the part. No more sloppy trousers, billowly shirts or oversize jackets. Here is how a uniform should fit. Too short. No good. Too long. No better. Too big. Doesn´t work. Always remember that your front line employees represent your company, as well as being a point of contact for current and potential customers ➜ align your uniform fit guidelines with your company look and brand identity. A common feature is the combo of jacket (blazer) and shirt. It´s stylish and professional. Shoulder divot. When standing with the arms down the side, the shoulder should be smooth. If there´s an indent below the seam, the fit is off. Avoid billowy sleeves. 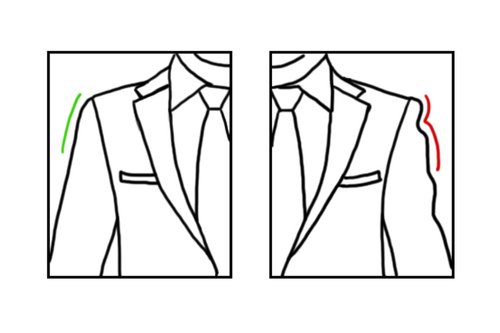 A jacket shouldn´t restrict movement or pull the shirt, but follow the contour of the arm. Avoid collar gap (space between the shirt and collar). Avoid the X. The jacket is too tight if an X forms around the button when fastened. Another takeaway is to be able to get two fingers down the collar band. Impossible ➜ Go for a larger size. Look better. Feel better. Perform better. COMFORT IS KEY. Uniform trousers should be comfortable as wearers move around to perform their daily tasks. Forget about tight fit around the hips or thighs. Aim for a few inches of allowance at the hips – and more on the thighs. Trousers should be able to stay up without a belt. Wearers should be able to get one, maybe two, fingers in between the waist and the waistband. Same rule applies for a professional skirt fit. Stretch fabrics are comfortable to wear and make for a great fit, while allowing for good movement. Too much excess fabric on the thigh area makes for a baggy, messy look. Have trousers hemmed to fit. Extra fabric resting on the shoes adds a sloppy twist. A professional look calls for the hem just slightly touching or overlapping the shoe. You should now have better understanding of a good uniform fit. Still in doubt ➜ reach out.